Tropical rainforest of Sorong city is a good site for visitors who are interested in hiking and watching birds and exploring the bio-diversity of tropical rainforest. The birding tours can be started early in the morning. As a tour guide, I could meet you at the hotel where you stay and then, together, we can go to the forest. We will go by car to the forest edge and trails that lead us into the forest. After that, we can start hiking to the ridge of the hills. 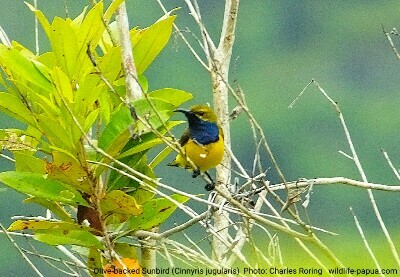 Birds that are active in the mornings are Olive-backed Sunbird (Cinnyris jugularis), Black Sunbird, Helmetted Friarbird (Philemon buceroides), Yellow-faced Myna, and Coconut Lorikeet (Trichoglossus haematodus). It is very easy to enjoy birding in this forest, visitors can watch birds that perch on the canopy of the trees that stand on the slopes or below the ridge. Palm Cockatoo, Sulphur-crested Cockatoo, Pinon Imperial Pigeon, and Papuan Hornbill can be seen flying over the forest. Male Hooded Butcherbird (Cracticus cassicus) likes to sing in the morning, especially when the weather is good to attract his female counterparts. Bringing a good pair of binoculars such as Swarovski EL 8.5 × 42 or Swarovski SLC 10×42 WB will greatly enhance the birding experience. I personally have got a pair of Visionking 10×42 mm binoculars that I use to find birds in distant trees and a Kinglux 20-60×60 spotting scope for better viewing of birds that sit still on a branch of a tree or on a rock. I used to guide birdwatchers who brought with them a Swarovski ATX 30-70×95 spotting scope. We used it during our 3-day birding tour in Sorong forest. This lower montane forest was the natural habitat of birds such as Dollarbird, Papuan Hornbill, Pinon Imperial Pigeon, Orange-bellied Fruit Dove, Eclectus Parrot, Fouble-eyef Fig Parrot, Black Lory, Yellow-faced Myna, Golden Myna, Red-cheeked Parrot, and a lot of other tropical birds of lowland forest. Sometimes, it is also good to bring a laser pointer for showing the location of birds on certain branch of a shrub plant or tree so that birdwatchers could see it using their binoculars. On the average, visitors can spend 1 to 3 days hiking, camping and birding in the forest. We have got tents, cooking and eating utensils that we store in the forest. So, visitors who want to take the tours with us do not need to bring all those heavy equipment. Visitors who only have got one or two days in Sorong can also enjoy day tour in this forest. 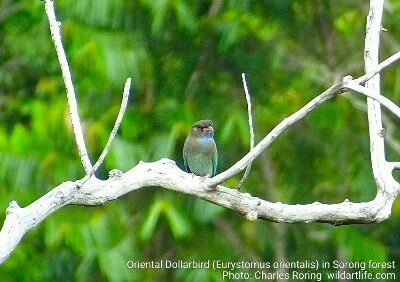 The birding tours in Sorong forest can be extended to Raja Ampat islands for 3 days to find such birds as Red Bird of Paradise, Wilson's Bird of Paradise, Beach Kingfisher, and Eastern Osprey. As the main gate to Raja Ampat islands, Sorong city is visited by hundreds of thousands of domestic and international tourists. Regular flights between Sorong and major cities in Indonesia such as Jakarta, Denpasar, Surabaya, Makassar, Manado and Ambon, as well as Manokwari and Jayapura are available every day. Garuda operates its regional jets Bombardier CRJ 1000, whereas Batik Air provides Airbus A320. Sriwijaya flies its Boeing 737. Wings Air connect Sorong and Manokwari; Fakfak as well as Kaimana by ATR 72-600 turboprop aircraft. 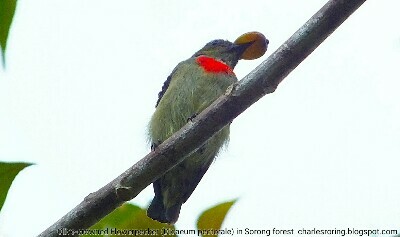 If you are interested in taking a birding tour in Sorong forest, please, contact me (Charles Roring) by e-mail to: peace4wp@gmail.com or by whatsapp: +6281332245180. Or you could use the contact form at the above link of this page.